Razzoo’s Just Wants to be Loved Bayou! Love is in the air and the countdown to Valentine’s Day is on. Do you have plans? Where are you taking that special someone to celebrate? Whether you’re planning a casual date night, or need a night out with the girls for a little Galentines day fun, Razzoo’s is the place to be! Here are a few of our well-loved Cajun menu items, perfect for sharing with the one(s) you love! Appetizers: Rat Toes & Boudin Balls all the way! On Valentine’s Day, start your meal off right with some delicious appetizers. And with the Rat Toes and Boudin Balls – two of our most popular appetizers – it’s normally love at first bite. Fried food wins the day, as our Rat Toes are simply shrimp and crab stuffed jalapenos and the Boudin Balls are Cajun fried balls of boudin goodness. Both are perfect for dipping in our amazing sauces. Want to try it all and share it with your sweetie?! Order the Cajun Combo Skillet. All the Cajun goodness rolled into one dish, you’ll get grilled andouille sausage, zesty shrimp creole, crawfish etoufee, and red beans ‘n’ rice. Don’t feel like sharing or think you need extra? Add some fried shrimp or catfish too! It’s finger lickin’ good, yall. Want to take a walk on the lighter side? Ask your server about our off the menu Fresh Seafood Dishes. A Razzoo’s classic, our Gator Punch is available in the full size fish bowl (serves 4) or the Gator Punch Jr. for a pint-sized buzz. What is Gator Punch, you ask? Just the most amazing trashcan drink made with Svedka Vodka, Bayou Rum, Kraken Spiced Rum, Southern Comfort, and Everclear. Leave some room for dessert because our Cajun Luziana Bread Pudding is out of this world good! Made fresh daily, our bread pudding uses crust French bread, peaches, and southern pecans, all drizzled in a dark rum sauce. You know you’ve got a good one when they can appreciate the casual Cajun cuisine at Razzoo’s Cajun Café! Happy Valentine’s Day from our crew here at your favorite Cajun food restaurant! Mark Your Calendar for National Margarita Day at Razzoo’s! If there is one thing we love, it’s a strong margarita. Even better if it’s on special. Yes – you heard that right! When you join us for National Margarita Day, you’ll get our famous Mardi Ritas for just $5, open to close. Each Mardi Rita is made to order with our house margarita mix (no store bought junk here) and El Jimador tequila. We use El Jimador because they use 100% hand harvested blue agave in every bottle – and it shows. Each sip is smooth and blends perfectly into the flavors of a margarita. Choose if you want your Mardi Rita frozen or on the rocks – or order one of each! At these prices, why not?! Step that margarita up a notch and make it an Abita Rita! It’s the Cajun twist on the Tex Mex favorite, since it features Lousiana’s own Abita craft beer in every glass. Our Abita Ritas are simply a schooner of frozen Mardi Rita with an extra Abita Brewing Co. craft beer jammed in on top. Pour it in, mix it up, and enjoy. You won’t be sorry! What Food Pairs Well with Mardi Ritas?! Already contemplating what food you want to pair with that Mardi Rita or Abita Rita? Many of our southern Cajun dishes would be perfect alongside a margarita. At lunch, sweeten the deal with one of our lunch specials like the Popcorn Shrimp Basket or the Grilled Chicken Etoufee. At dinner, we can’t recommend the Gator Tail enough. It’s a customer favorite and a top seller for a reason! Join us any time on National Margarita Day – Feb. 22 - to get these amazing drink specials at Razzoo’s Cajun Café! Get Your Super Bowl Grub at Razzoo’s Cajun Café! We now know who it’s going to be: New England Patriots vs. the Los Angeles Rams in the 2019 Super Bowl on Feb. 3! And whether you’re hosting a big party, attending a party, or just laying low at home, make Razzoo’s your choice for game day grub. Razzoo’s Cajun Café has now partnered with DoorDash to bring your Cajun favorites into your home – with no effort from you! All you’ve got to do is click on the “online ordering” tab on our website, select DoorDash, and begin the order process. Hurricane shrimp, red beans and rice, gumbo, fried catfish, and more – it’s all available for delivery to your door. Of course, you’re always welcome to do takeout as well, but really, why leave the couch? Turn the game on, place your order, and just wait for your delicious Cajun food to arrive. It’s the perfect way to eat the best Cajun food in Texas without missing any of the game! Feeding a crowd? May we suggest selecting an assortment of appetizers and having them delivered? Your friends and family will love them! Rat Toes (jalapenos stuffed with crab and shrimp), boudin balls, fried pickles, fried gator tail, and popcorn shrimp are some of our customer favorites that are sure to be a big hit. Your Super Bowl guests will thank you for bringing in the good stuff! So remember: when you don’t want to leave your couch, Razzoo’s Cajun Café can deliver! Simply visit our Online Ordering page and get started. Of course, you must have a Razzoo’s near you – so don’t get too excited if you’re out in the boonies. Razzoo’s Cajun Café proudly delivers in the Lewisville, Tyler, Round Rock, Arlington, Cedar Hill, Fort Worth, Lubbock, Pasadena, College Station, Houston, Garland, and Spring areas. Health Food at Razzoo’s? Here’s What We’ve Got. This classic chef salad has it all! Great taste and tons of goodies to fill you up! (We can’t have you leaving hungry, can we?) Crisp greens are topped with bacon, cheese, tomatoes, cucumbers, diced eggs, and fried onions (hold those if you want). Want to add a protein? Choose between the blackened chicken and the popcorn shrimp. While this is technically a starter, it makes a great meal for someone looking for smaller portions or a lighter lunch. 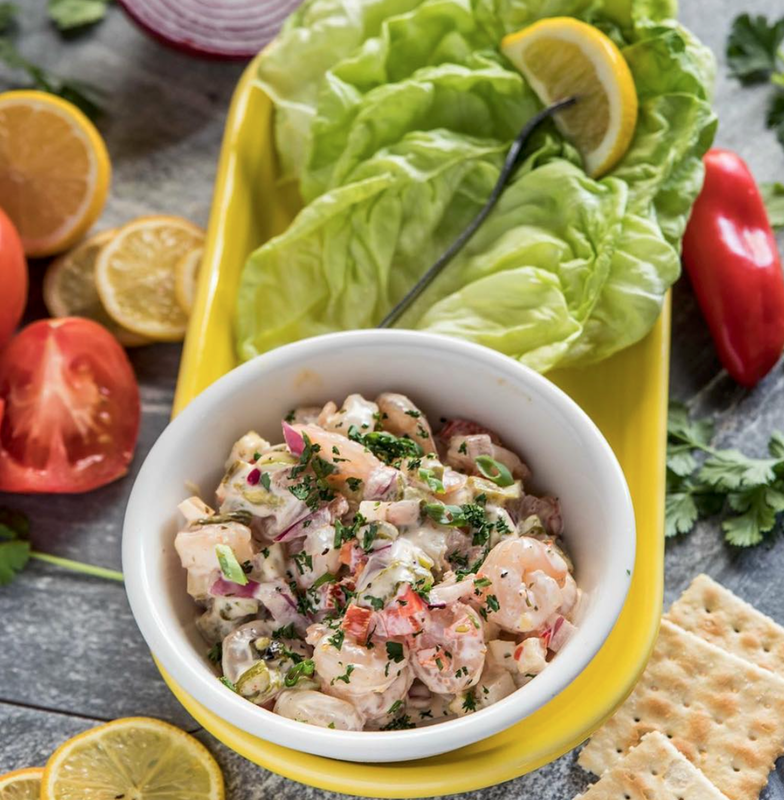 These lettuce wraps feature a creamy shrimp salad that you scoop inside lettuce cups; served with fresh veggies on the side. So good, you’ll forget it’s actually healthy. Just plain ole peel and eat shrimp are one of our favorites! We Cajun boil to perfection, then serve cold with your favorite dipping sauces. Add a small side salad or order of veggies and you’ve got a complete meal. We’re counting this because it is a salad, but our Caesar dressing is almost so creamy and delicious it’s a crime. The traditional Caesar salad is so good. If you’re looking to cut calories, ask for the dressing on the side so you can add to your preference. New Year’s Resolutions got you trying to eat healthier?! Don’t be afraid to join us at Razzoo’s Cajun Café - the best Cajun food restaurant in Texas! You CAN stick to your healthy eating at Razzoo’s. Just ask your server for all the options. But hey, if you want to cheat…that crawfish etoufee, Cajun fried chicken, and andouille red beans ‘n’ rice are calling your name.